Ten-Salmon Float. Trailer with ten finished salmon plus one alevin. Twenty feet long. 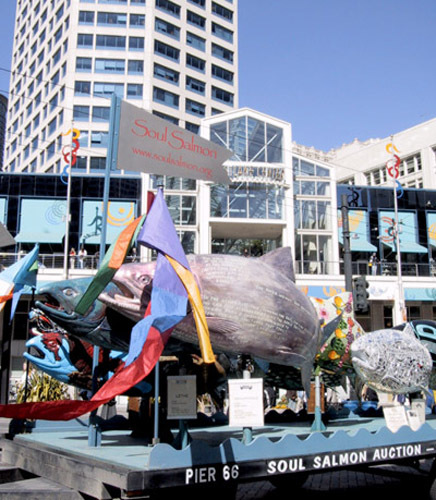 The artist toured the region around Seattle with the float before the Auction in April, 2002 with banners flying at all four corners of the trailer, specially designed to hold ten of the finished "Salmonart". One small alevin sculpture (yolk sack salmon fry) was also attached to the migrating "school". Thanks to Edgewater Inn, Seattle, for the hospitality.